Comments on "First Big Day Of Shows"
I'm totally in love with the photograph of the woman facing the street with her cell, hand on top of her head. Love! I really wish Suzie Menkes would get rid of that pouf roll on her head. identiy crisis! 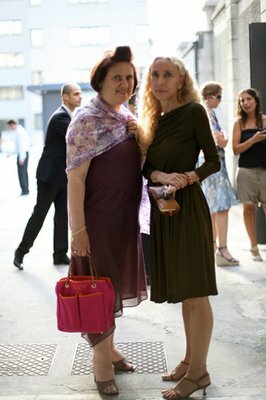 Franca Sozzani is always super chic!!! I think someone is having a lot of fun....Please please ...let's try for a photo of Carla and Franca Sozzani together. They are insanely chic. For God's sake someone link me to the Sartorialist's blog on men.style.com! I've been to the site and have browsed the posts here (again) to see if I've missed it. Yet to find a link, so here I am asking you all! By the way - adore the back. Adore the woman on the phone. Adore the two old ladies. Adore them all. I really want that white dress with the nice back, though! Oh my god - is the woman in the 2nd pic with the same woman as in the 1st pic? ooh. la. la. really lovely pics! what camera are you using? I am yet to see that many glamorous women in NYC. How do they walk around in those heels? If I tried to do that, the streets of NYC would murder me within the first 5 minutes! Franca Sozzani! My queen. She looks so wistful. The girl in the white dress is Emine Sander. A fashion journalist from Sweden. how does Franca always manage to look so chic in such a simple way? god, she's awesome! !